I don’t know why it took so long to combine Network, Broadcast News and American Psycho, but Nightcrawler is here now, so buckle down for a helluva ride. It is a mesmerizing film, propelled by a career-defining performance from Jake Gyllenhaal. Years from now, his “Travis Bickle” may very well be Lou Bloom, a strangely polite, utterly driven man in search of a purpose. He finds it via an old camcorder, which becomes his passage into the life of a freelance videographer in L.A. Night after night, Lou waits by a police scanner for a chance to be the first at a crime scene and come away with footage that will fetch a high price from the local TV news stations. Writer/director Dan Gilroy has several screenplays under his belt (The Bourne Legacy, Two for the Money) but may be best known as Russo’s husband. That should change, as his debut as a director is awash in style and biting creativity. Call it poetic justice that Nightcrawler is opening just as TV news enters the November sweeps ratings period. Yes, the film hits the “if it bleeds, it leads” mantra and hits it hard, but doesn’t shrink from wondering just who that indicts: the show or its audience? As Lou’s sociopathic tendencies lead him to become more and more involved in the stories he’s covering, the film sharpens its satirical claws. Fear-mongering, class warfare, “bootstrap mentality” and more take a beating, with Gilroy showing great instincts for when to pull back before his hand becomes too heavy. His gets a great assist from Oscar-winning cinematographer Robert Elswit (There Will Be Blood), who bathes the film in dark, sleek shine, making Bloom’s seedy world inescapable. But the anchor here is Gyllenhaal’s can’t-look-away performance. He makes Lou Bloom an American psycho for today, unfazed by business cards but unable to tolerate anyone altering his plan for upward mobility. He’s all smiles and positivity, all the while analyzing your weaknesses he will unapologetically exploit when necessary. 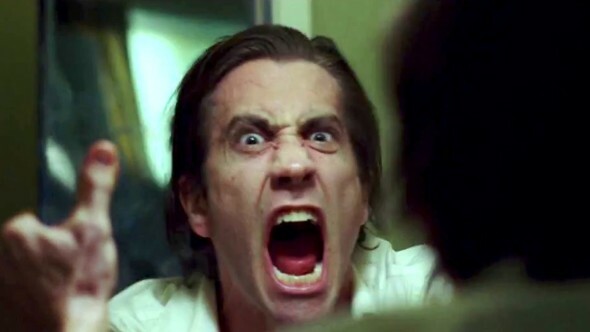 Everything about Nightcrawler should be in the 2014 awards mix. Chase this ambulance down, and fast.